Pink Camouflage Quilt with FREE Embroidery 52 x 35"
Lap quilts are perfect as a cover while relaxing and reading or watching TV. No two quilts are exactly alike. Many fabric options available. If you don't see your fabric choice, ask us to custom make one for you. •	All quilt squares are machine sewed and HAND QUILTED. White or off-white muslin back unless otherwise pictured. •	Cotton front and back. Batting is 80/20 cotton blend. •	Machine wash cold water, gentle cycle and tumble dry low or hang to dry. •	Grandmom Marie makes the quilt and Daughter Tina custom embroiders it. Add item to the cart and you'll see "Add Optional note to Seller". This is where you indicate the name you want me to embroider on the quilt. Choose the color thread you prefer from the sample collection chart in photos. BE SURE TO SPELL NAME CORRECTLY (I will embroider exactly what you note ). I can embroider the name in the center on the quilt or in a corner. Monogramming is also available in two fonts (vine and circle) and usually looks best in a corner square. Typical monogram order is: First, Last, Middle Initials. Therefore if your name is Jane Mary Smith. The monogram would be JSM. •	All gifts are made to order. •	In stock items will be shipped USPS from Florida (or hand delivered if local for faster service) within 48 hours of confirmed Paypal payment. •	If item in not in stock, we will give you best estimate of expected delivery. •	Once item is personalized it cannot be returned so please ask questions and be accurate with communication of personalization. Thanks for the joy of creating WITH you! 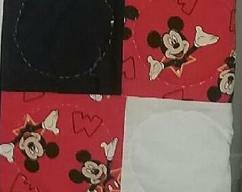 White Holly Christmas or Winter Themed Lap Quilt with FREE Embroidery 28 x 55"
Mickey Mouse Lap Quilt 30" x 49"
Christmas Santa Lap Quilt with FREE Embroidery 57 "x 33"